Anyone of you experienced while you were inside the mall with your kid roaming around when suddenly your kid is gone? You panicked and must have fainted for you do not know what to do. Some parents, to avoid this thing to happen tie their kid so he/she won’t get far. 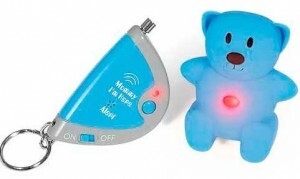 At this digital age, we don’t have to worry anymore especially that there are gadgets like the “Mommy I’m here”.It is an audible device that creates a sound when you press a button so you may know the exact location of your child in the event he/she will be out of your sight. Check here for the complete info. This entry was posted in Fab finds and tagged Mommy I'm here gadget on April 11, 2011 by Mommy Yam. This is a cute and innovative invention! I think I need one of these for my daughter. LOL!